It’s time for another Distributed Proofreaders celebration: Our 16th Anniversary! Last year, we commemorated our 15th Anniversary with a look back at our many accomplishments since DP’s founding on October 1, 2000. Here’s a retrospective on DP’s achievements over the last year. 31,000 titles. In December 2015, DP posted its 31,000th unique title to Project Gutenberg, Colour in the Flower Garden. You can read all about it in this celebratory post. 32,000 titles. Just five months later, in May 2016, DP posted its 32,000th title, Tik-Tok of Oz. See the blog post on this milestone for more on this and other books in the beloved Oz series that DP has contributed to PG. The Expositor’s Bible. In December 2015, DP posted the second volume of The Expositor’s Bible: The Book of the Twelve Prophets, a 19th-Century commentary on the Bible by leading British theologians of the day. With 564 pages, 38 chapters, Hebrew, Greek, and Arabic quotations, and 1,556 footnotes, this single volume was a massive project in itself. But its posting marked the completion of a 50-volume set, all produced by DP – an outstanding achievement. Charles Sumner’s complete works. In January 2016, DP posted the last of 20 volumes of Charles Sumner: His Complete Works, all contributed by DP. Charles Sumner (1811-1874) was an important 19th-Century American senator, abolitionist, and civil rights activist. Princess Napraxine. Also in January, DP posted the third and final volume of Princess Napraxine, one of the most ambitious novels of the British writer Ouida (pen name of Maria Louise Ramé, 1839-1908). It is the tragic tale of a beautiful, worldly woman, the wealthy man obsessed with her, and the penniless young girl he marries to forget her. Revolutionary correspondence. In July, DP posted the second volume of The Diplomatic Correspondence of the American Revolution. This completed a fascinating 12-volume set of letters involving nearly every significant figure in the American Revolution, edited by the noted 19th-Century historian Jared Sparks. DP contributed all 12 volumes. A Plain and Literal Translation of the Arabian Nights Entertainments, Now Entituled The Book of the Thousand Nights and a Night – The first two volumes of a privately-printed, 17-volume set of Sir Richard Burton‘s famous (and risqué) collection of Arabian tales. Fifteen Months in Dixie – a memoir of a Union prisoner of war during the American Civil War. Captain William Kidd and Others of the Buccaneers – pirates! Fifteen Years among the Top-Knots: Life in Korea – memoirs of a missionary nurse who served in Korea in the late 19th Century. In the Path of the Alphabet: An Historical Account of the Ancient Beginnings and Evolution of the Modern Alphabet – ABCs of the ancients. The Fifteen Watt Tungsten Lightbulb – a 1912 master’s thesis in electrical engineering. 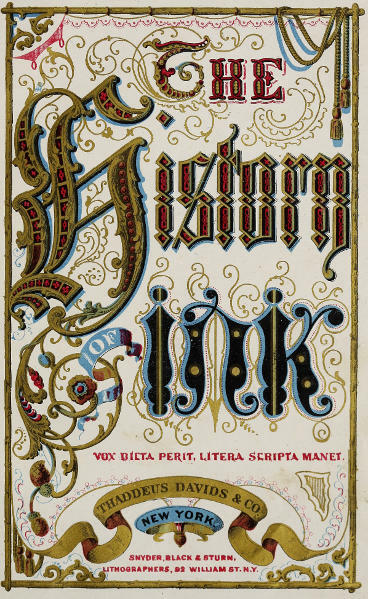 The History of Ink, Including Its Etymology, Chemistry, and Bibliography – copiously illustrated. Vijftien Dagen te Londen, op het einde van 1815 – a Dutch translation of Quinze jours à Londres à la fin de 1815 (Fifteen Days in London at the End of 1815), a collection of amusing sketches on London life by a French traveler. When Gretel Was Fifteen – World War I adventure for teenage girls. Un año en quince minutos (One Year in Fifteen Minutes) – a one-act Spanish play. Boyville: A History of Fifteen Years’ Work Among Newsboys – a paean to a bygone occupation. Dr. Mabuse, der Spieler (Dr. Mabuse, the Gambler) – a German novel by Norbert Jacques, starring the master criminal and hypnotist who later found fame as the villain of several Fritz Lang films. Fifteen Sonnets of Petrarch – a selection of Petrarch’s immortal love sonnets, in Italian with English translations by Thomas Wentworth Higginson. Geld und Erfahrung (Money and Experience) – a memoir by German inventor Max Eyth. Napoleon’s Appeal to the British Nation, on His Treatment at Saint Helena – he wasn’t happy. Proof-Reading – a subject after DP’s own heart. Rinaldo Ardito – previously unpublished fragments of an epic poem attributed to the great Italian poet Ludovico Ariosto. Social Environment and Moral Progress – a study by the noted British evolutionist Alfred Russel Wallace. George Ticknor Curtis’s two-volume Life of James Buchanan, 15th President of the U.S.A., is wending its way through the rounds at DP, and will soon be posted to PG. DP posted a whopping 2,156 titles to PG over the last year. the establishment of a DP Official Documentation wiki. Happy Sweet Sixteen to all the DP volunteers who made these achievements possible! This entry was posted on Saturday, October 1st, 2016 at 4:27 am and is filed under Special Day. You can follow any responses to this entry through the RSS 2.0 feed. You can leave a response, or trackback from your own site. Hope the celebrations include lots of cake and ice cream. The food’s virtually calorie-free, as all internet food is, so we can eat all we want with no stress or guilt!